First and foremost we would like to thank our biggest supporter NORSAND BOATYARD and more specifically Jo and Murray. Over the past 10 years they have always given us their support and back up and they were the first 'onboard' with our new project. 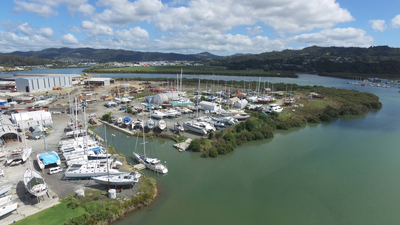 We are lucky enough to consider them part of our New Zealand Family and if you are en Route to New Zealand we can only recommend you look up Norsand Boatyard for all and any of your next haul out needs. 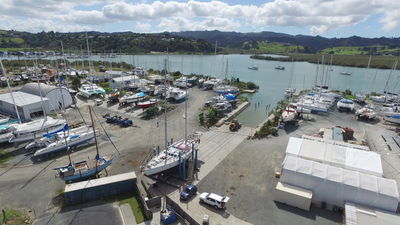 ​Norsand Boatyard is one of the most popular boat yards in Whangarei, New Zealand, while they advertise hard stand provisions for over 70 yachts, it is not uncommon to see over 100 boats on the hard during their peak season. They can cater for vessels up to 100 tons and a maximum beam of 11m. Multi-hulls are a speciality at Norsand, hauled on a custom built hydraulic trailer capable of lifting a 40 ton multi-hull up to 1.5 metres high if required. ​They have all services on-site including boatbuilders, painters, riggers, diesel and mechanical engineers, welders, labourers, fibreglass and osmosis repairs, waterblasting and abrasive blasting. Norsand can manage your refit, overseeing contractors on your behalf, just contact the friendly and experienced staff and enquire today to book your next haul-out.